Pope Benedict is very generous with his blessings. He is such a good Christian...and a great judge of character!! 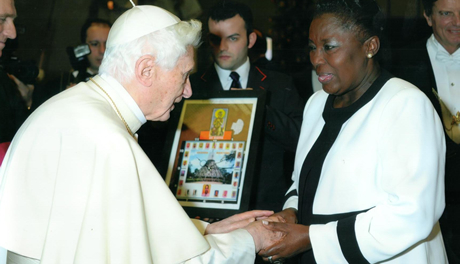 Kadaga who led a delegation of Ugandan legislators to the Vatican expressed delight at meeting the Pope and visiting St Peter’s Basilicca. “I think this is a moment that cannot be repeated. We have been reading about him, hearing stories about St.Peter’s Basilica but now we are here physically. I think it is something that I will remember all my life. Its a very great moment and I thank God for this opportunity,” she said minutes after meeting the Pope. The Speaker dedicated to all Ugandans readings from the book of St. Mark which the Pope quoted in several languages during the Vatican mass.